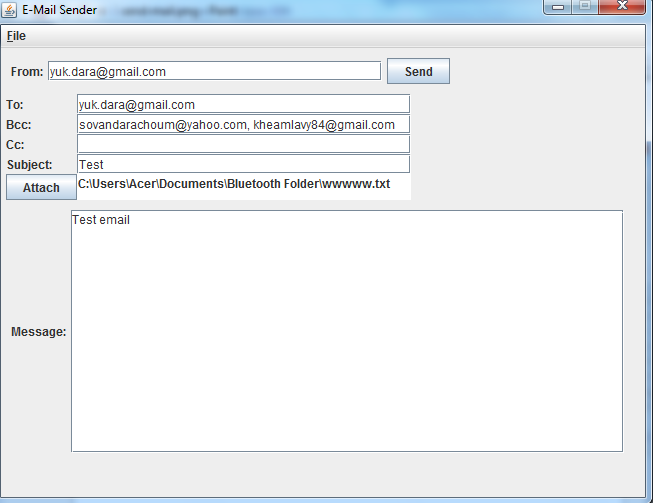 This is a simple E-mail in Java program. You can use it to send message with multiple attachments to multiple recipients at the same time. 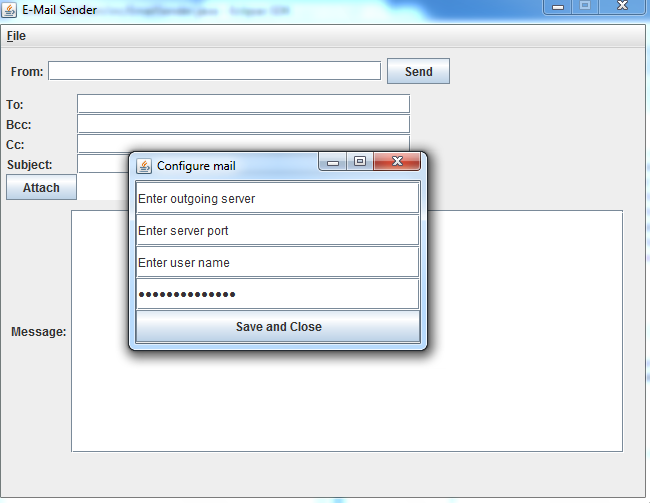 Before you use the program to send e-mail message, you will need to configure the mail. 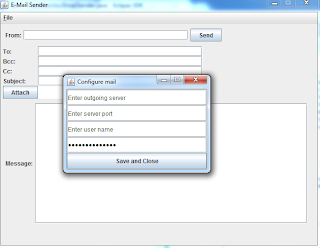 The configuration form allows you to enter the outgoing server name, port, user name and password to log in the server. For security reason, your password is encrypted. The configuration file (mailconfigs.con) is stored in your current working folder. You can configure the email by going to File menu->Setup Configuration...One you configured the mail correctly, you do not need to configure it again later. After you configured the mail, you will need to input the From address (your e-mail address), the recipients' e-mail addresses, subject, and message of the mail. Bcc, Cc e-mail addresses, and file attachments are optional. In Java, it is easy to send e-mail by using the Apache Commons Mail api. You will download the Apache Commons Mail api from its website. This api depends on the Java Mail api. You can download Java Mail api from here. After downloading the two api, extract the zip files and add the jar files (commons-email-1.3.2.jar and javax.mail.jar) to the Java Build Path in the Eclipse. In the Commons Mail api, there two classes that can be used to send e-mail message. One class is SimpleEmail. 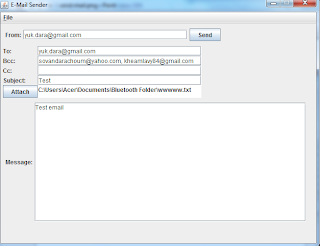 The SimpleEmail class is used to send e-mail message without attachment. Another class is called MultiPartEmail. This class is able to send e-mail message with attachments. Like the SimpleEmail class, the MultiPartEmail class has methods that allow you to configure e-mail in your Java code. There are other methods that you will use to set the From e-mail address, To e-mail addresses, Bcc e-mail adddress, Cc e-mail addresses, subject, message, and attachment of the mail. Here is the complete code of the E-mail in Java program. can you explain more .